To the uninitiated, the process is foreign. To those familiar with the game, this is just a typical evening with the girls, evenings that have been happening in America for nearly 100 years. 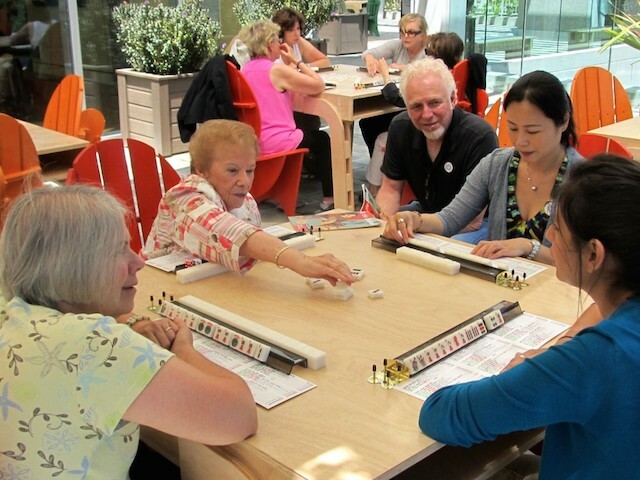 There’s no question that scores of Jewish women have played Mah-Jongg, a betting game that requires matching domino-like tiles into rummy-like patterns. From the tenements of New York City to the bungalows of the Catskills and the vast American suburbs, Jewish women have kept alive a game that otherwise fell out of fashion in the 1920s. Mah-Jongg’s precursors may be centuries old, but the game most Americans know dates back only about 150 years. Around 1846, a servant of the Chinese emperor combined the rules of popular card games of the time, and replaced cards with tiles to create Mah-Jongg. The name itself means sparrows–an allusion to the pictures of birds often engraved on the tiles. The advent of Mah-Jongg coincided with China’s opening to foreign traders, after the First Opium War (1837-1842). One American businessman, Joseph Babcock, traveled to China on behalf of the Standard Oil Company in 1912 and brought the game back to America. He changed the numbers on the tiles to numerals with which Americans are familiar (1, 2, 3, etc.) and by 1920, Abercrombie and Fitch, then a sporting and excursion goods store, was the first place to sell Mah-Jongg in America. Throughout the 1920s, the game was a popular craze. Over time, to make the game more difficult and exciting, playing groups made up their own “table rules.” As these homemade regulations became more complex and convoluted, players eventually became turned off by the game and the challenge of ever-changing rules. By the end of the decade, the Mah-Jongg fad had died. But Jews, particularly Jewish women, did not let go of the game. In 1937, a group of Jewish women formed the National Mah Jongg League (NMJL), which to this day strives to maintain consistency in the game. Each year the League issues a card listing winning combinations of tiles (which change every year) and standard regulations. This stability helped the game to survive. But Jewish involvement in the League doesn’t fully explain the Jewish Mah-Jongg phenomenon. According to Anita Luu and Christi Cavallero’s book, Mah-Jongg: From Shanghai to Miami Beach, “Throughout World War II the game continued to be played among Jewish women’s circles as it increased in popularity and became more prevalent in their lives.” While their men were off at war, Luu and Cavallero explain, women found Mah-Jongg to be an inexpensive form of communal entertainment. In the urban setting of New York, the game quickly spread from friend to friend, mother to daughter. Another group of historians suggests that Jews who fled Nazi Europe and made it to Shanghai got involved in local culture and adopted the game. Once those refugees immigrated to America in the mid-20th century, they helped keep Mah-Jongg alive. A completely different theory comes from Ruth Unger, current president of NMJL. She believes that the game was perpetuated in part because it is a philanthropic money-making endeavor for Jewish organizations, notably synagogue sisterhoods and Hadassah chapters. These groups sell Mah-Jongg rule cards and receive donations from the League. In order to sell enough cards, they have had to keep people interested in playing the game, so they continue to teach Mah-Jongg to their members. 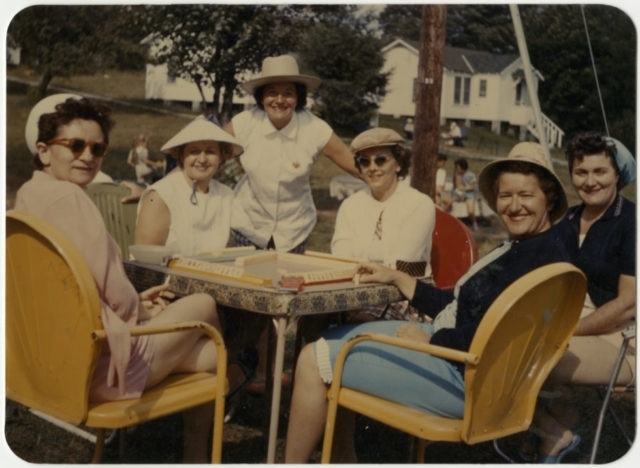 New City, New York resident Joan Cooper fondly recalls spending childhood summers at these colonies, where her mother and friends would play Mah-Jongg every weekday, until Friday afternoon, when husbands and fathers drove up from New York City. As newer generations take up the game, they learn that many true friendships can develop from it. And that’s not frivolous at all. In the documentary Mah-Jongg: The Tiles that Bind, seasoned players say that Mah-Jongg is their life. As women play for years and decades with the same people, they share life events–marriage and divorce, the birth of children and then grandchildren, work and retirement. It’s even said that when the last woman of a Mah-Jongg groups dies, it’s her job to “bring” the Mah-Jongg set with her to the World to Come. A close look at the role of women and girls in the early American suburbs.